As one family recovers thanks to their son's life-saving efforts, a nearby church is holding its first service since the devastating storm. 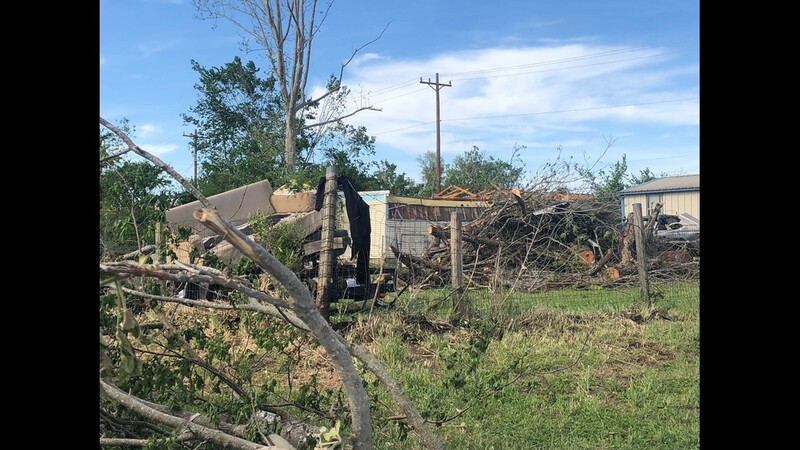 FRANKLIN, Texas — Despite the devastation, the words mumbled among many of the neighbors in the neighborhood along Highway 79 and Ranch Road 46 in Franklin was "we will rebuild." Sunday morning was a day to pick up what was left for the Henry family. Their duplex was completely destroyed. Walls, windows and the roof were scattered all across the land, and among the debris was just a few of the salvageable things they owned. "It's like one minute you're normal, the next minute you're homeless," said Connie Henry as she held back tears. Seeing the mess the storm left behind was a complete heartbreak. "There's a chair from my dining room," she pointed out. "All my kids' clothes are scattered." A Category 3 tornado ripped through the place they called home, but they weren't the only ones affected. 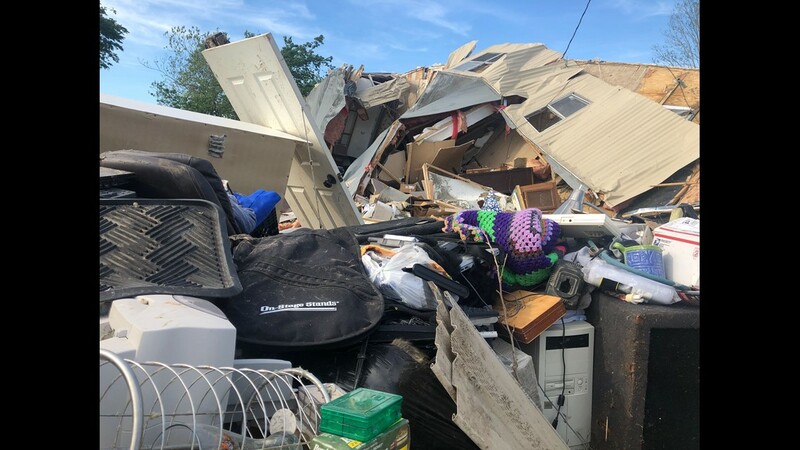 According to the Richardson County Sheriff's Office, more than 55 homes were destroyed, four businesses were damaged, and two churches took a hit. 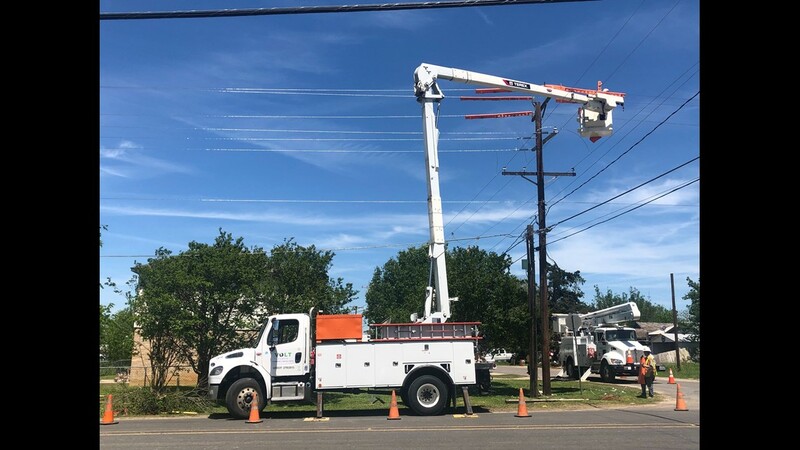 As of Sunday afternoon, about 4,000 people were without power in Robertson County, whose population is roughly more than 16,000. 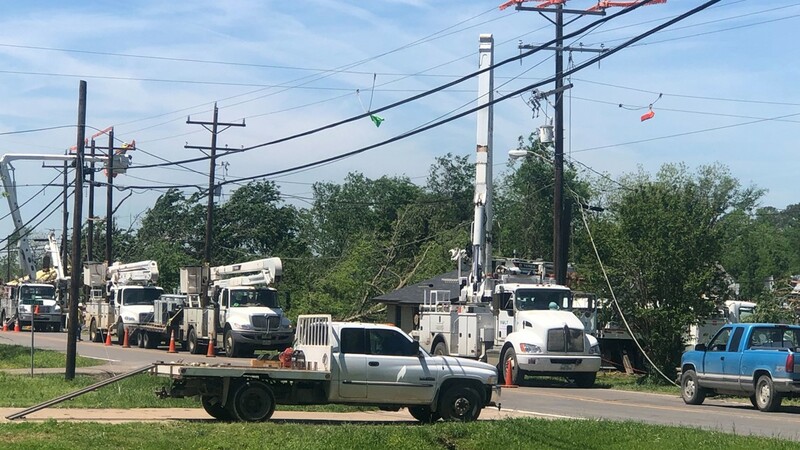 As of 11 p.m. Sunday, all but 450 were back up after 140 crews went to work to restore the main line. Schools in Franklin have been canceled on Monday, and shelters remain in place at the American Cross and First Baptist Church. According to the Red Cross, all but one family will go home once power is restored. 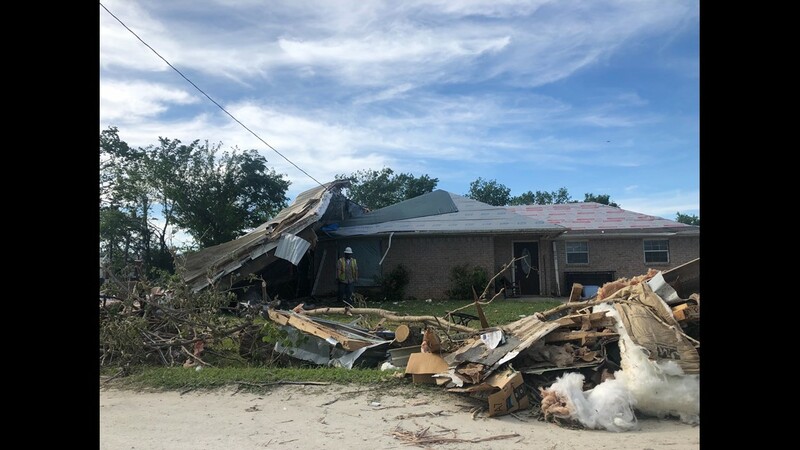 A curfew is in place for the affected area south of US-79, from 9 p.m. to 7 a.m.
Several miles down the road in the town of San Gabriel, Texas, the San Gabriel Christian Church had its first service. About a week ago, a possible tornado damaged their place of worship. "God is good," said evangelist Billy Bob Cox, as he stood among the gutted out little church. The church is known for being the oldest congregation in Milam County. After a week of cleaning up the disaster left by the storm, they were finally celebrating service for the first time in a temporary place of worship. "This is all material stuff," said Cox. "It's a blessing no one was severely hurt." According to the Robertson County Sheriff's Office, more than a dozen people were injured and treated by EMS in the area affected in Franklin. Many of the people self-transported themselves to local hospitals, but all of them in Robertson County without life-threatening injuries. "We were right here," said Connie, as she pointed to a small hallway in the middle of her duplex. She and her husband, Victor, created a barrier over her six children with their bodies. Fortunately, their youngest son was out of town at a birthday party. The moment the twister sucked the air from inside the home, Victor was lifted up from the ground. "It almost took me," Victor said. If it wasn't for their 14-year-old son, who held on to him for his life, the 140 mph winds would have taken him away. Young David lost all his video games, school equipment and clothes, but the moment he will never forget is holding on to his dad to save his life. The tiny hallway in the middle of the home was the reason the family didn't get hurt. Everything around it was completely destroyed, taking almost everything that they owned. "It's a sense of family," said Henry, overwhelmed to see the great amount of support from people all over he state. "It's like we're a community family, blood family," she said. Among the rubble was a group of men and women who drove down in Jeeps from Austin. 7 Slot Response added a new photo. "We're just a group of people who just want to help," said Jason Glass, creator of the group Seven Slot Response Team. "Us Jeep people get together and help each other out in the community," Glass said. "Not just other Jeep people but everyone." More than a dozen Jeeps lined up the streets of Ranch Road 46, everyone inside their Jeeps out getting dirty, picking up as much debris as they could. "I think the main thing is people don't know where to start," said Glass, as crews tied a piece of the wall outside the home of the Henry family. The group was using their Jeeps to help pull large material to the side of the road for cleanup. 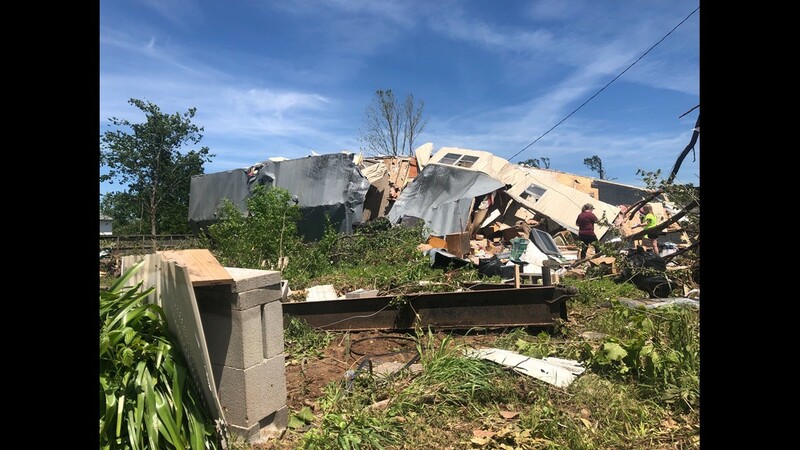 "This is what we do," he said, "help clean up and generally it makes people realize everything is going to be OK."
"When the tornado was gone, it's like help was coming in," said Connie. Shortly after, crews with the American Red Cross walked up to Connie and handed her a shovel and a bucket full of cleaning material. The most sincere "thank you" mumbled Connie as she grabbed the donated utensils. It's a collaboration of simple gestures done to families who have lost everything in the town of Franklin. It's a sense of gratefulness the family will cherish as they rebuild from the tornado's mess. "It was a blessing to see how everyone came together," Connie said. The family is now left homeless, yet grateful to be alive, as they figure out what's net for the place they call home. SouthStar Bank in Franklin has set up an account for those who would like to donate -- just say the money is for Franklin tornado relief. The South New Hope Baptist Church is taking clothing donations. Citizens are reminded to remain vigilant about donations fraud and who shows up offering services.